Holy Smokes it has been a long time since I’ve blogged; to be fair though I haven’t read all that many books anyways (Damn you, law school!). Life has been crazy rushed and hectic since the last time I posted. We have finally moved and are living happily in the City of Magnificent Distances (that’s DC for all you folks who don’t get caught up in cities’ nicknames). Our neighborhood is ridiculously adorable, cozy restaurants, strung lights glittering the streets, and, best of all, a brand new library(!) all minutes from my door. And, the history in this area! Naturally, the history lover in me is freaking out with all there is to see. I’m seriously in love with living in a capital city, you know, a place where tourists actually come. I even love my morning commute (kind of) because I pass the Washington Monument, cross the Arlington Memorial Bridge, giving me a great view of the Lincoln Memorial, and all the sites around the Nation Mall area. It’s just incredible and I really believe DC could be just as beautiful as any European City, except for the bloody skyline! DC does so well with the old historic buildings and the like but it just doesn’t have the skyline of a city like Prague with all of the church spires (Fun fact: Prague’s nickname is the City of a Hundred Spires. You’re welcome). As wonderful as everything has been, it has been crazy busy. School takes up half my day and then work takes up the other half. It’s kind of funny because the place I am an extern at has me in this huge office with 8 cubicles. I take up one and the others are . . . empty. Yup, that’s right completely empty. I’ll randomly see people in the hall or when I get my lunch but other than that I’m kind of separated from everyone else. Well, except for one day when the other attorneys found out I existed and then they all came in to say hi make sure it was true. While it is nice to be left alone I kind of wish the other desks in there were full of people and in a way I guess they kind of are. See over the summer I’m pretty sure they had 8 externs because each desk look like someone is still occupying it. Notepads are open, post-it notes, drawers are full and I even found a Birthday card pinned to the wall of one. “Happy Birthday Zach! From the gang! Signed by Suzie, Robin, Debbie, John, and Roxanne!” And all I could think was that this was once a happy place; laughter lived here once. Now it’s just a sad little room occupied me and these weird ghosts desks; which I leave alone, out of respect. Enough chatter, let’s get to the book! 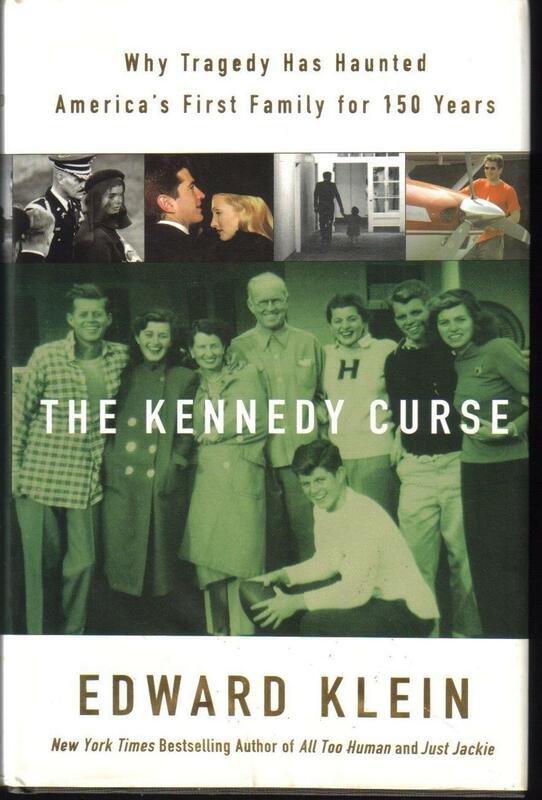 I just finished The Kennedy Curse: Why Tragedy Has Haunted America's First Family for 150 Years by Edward Klein. I originally bought the book at a book fair because I have strange fascination with the Kennedy family. I decided to read it right before finals because I thought it would be a dry, historical read. You know not terribly interesting but something educational to read on the commute. Turns out I was wrong (great for Reader Brittany, bad for Studying Brittany) and the book was amazing. It focuses on the tragedies that surround the family. One part of the book notes “one Kennedy has died every two years since the 1800s”, that's staggering. I enjoyed how the author arranged the book, focusing on a specific family member in each section. The main “characters” were JFK (of course, but don’t get this book expecting to read a lot about the man himself; it isn’t that kind of book, the author is really focusing on why the family is so cursed), his father, Joseph Kennedy, his sister “Kick” Kennedy, Patrick Kennedy (the first Kennedy to migrate to the States, and JFK, jr. Each section details how the curse affected(or effected? I never know) them specifically and speculates on why the family has been cursed. At first, I was a little disappointed with the obviously biased writing which didn’t portray the Kennedys in the best light. However, I then realized this was necessary in order for the author to develop his theory surrounding the curse. Bottom Line: I give it 4 out of 5. If you’re interested in the Kennedy family read it. It’s a unique perspective on a story that has been told a hundred times and I was never bored while reading it. I hate to say it was entertaining because the subject matter revolves around death but it was, so now you know I'm a bit dark and twisty. And I'm not sure what I will be reading next because I have finals for the next three weeks (Oh Sweet Jesus! ).